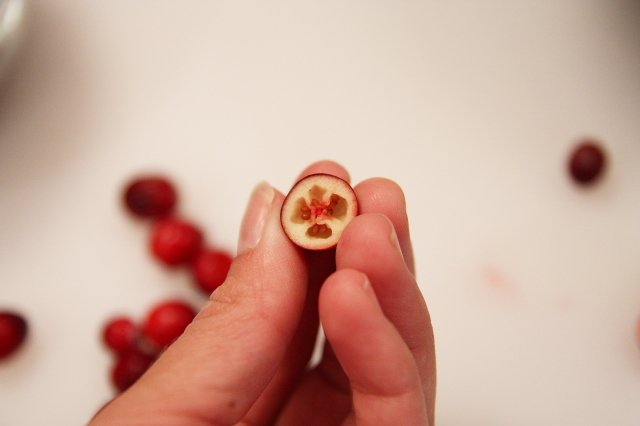 Start by cutting your cranberries in half. Doesn’t that sound tedious? Well, if you have a food processor you can quickly pulse them, just please don’t pulverize them. And honestly cutting them in half isn’t as bad as it sounds, just watch your finger tips because they like to roll. And once they’re cut in half you can roughly chop them or leave them in halves. 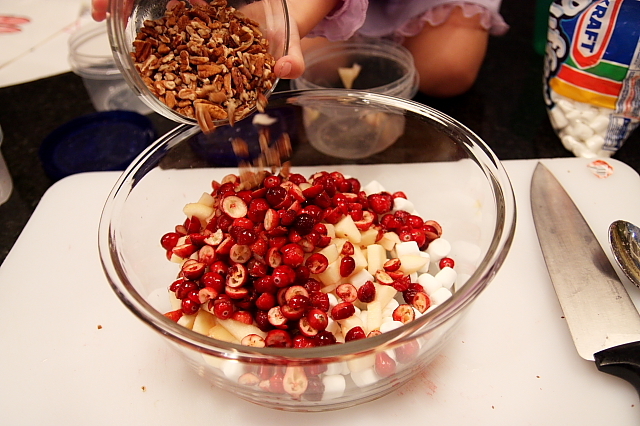 Then enlist the help of a child to add sugar to the cranberries. If your child likes to talk back or use unkind words you can sit some of the “un-sugared” cranberries aside and make her eat them when tart words come from her mouth. 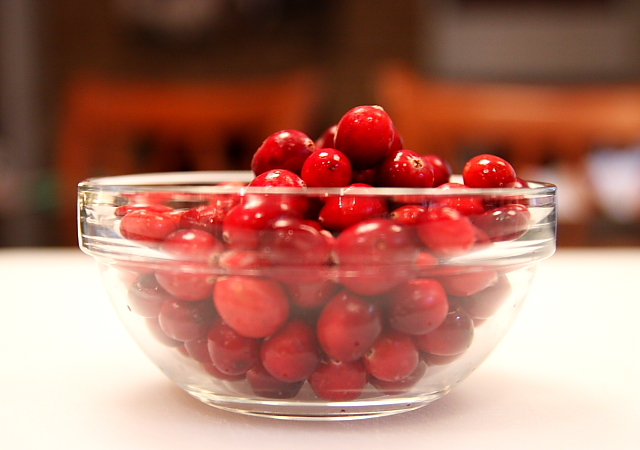 Plain cranberries with no sugar are quite distasteful and are powerful for correcting. You’ll also need, peeled and diced apples. I doused mine with cranapple juice to prevent them from turning brown and cut them on the same board I used to cut the cranberries so they are peppered with cranberry seeds. 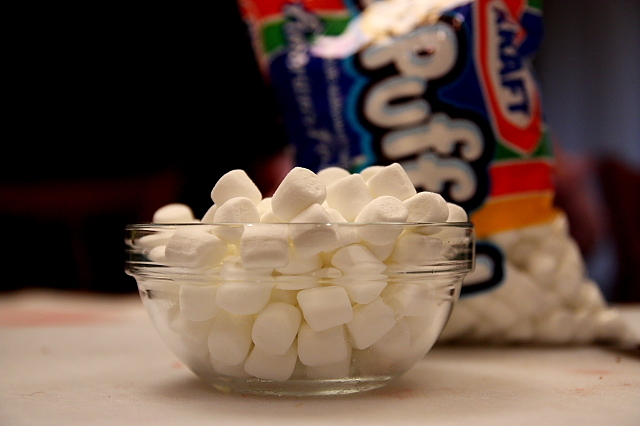 And there are also marshmallows included. And yogurt. I feel certain Katie’s mom uses plain but I like a little added sweetness & flavor of vanilla. Pretend like the cranberries have soaked in the sugar for at least several hours or overnight. I incorporated all the ingredients with the help of a child in a “colorful” purple nightgown. “Colorful” is the nicest word I could think of to express how I feel about this nightgown. 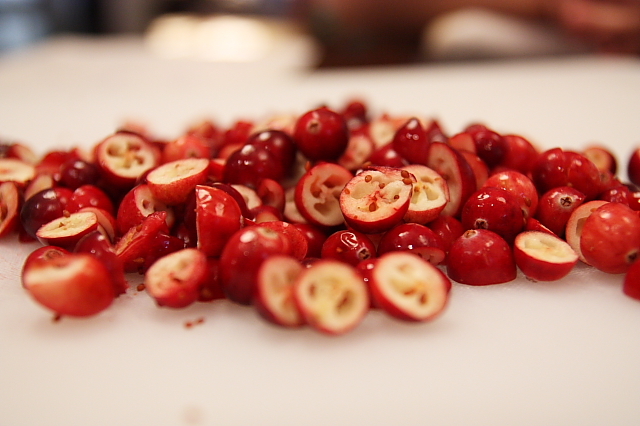 An entire bag of fresh cranberries makes a entire batch. I used half a bag of cranberries, a half a bag makes half of a batch. I will share the recipe for the WHOLE BATCH. And I’m not good at measurements, I like to guesstimate, so hang with me. I made these measurements up, you’re welcome to increase/decrease/omit to your liking. 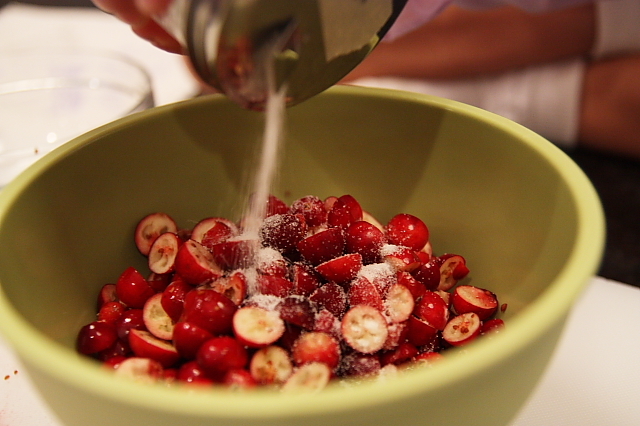 Add sugar to cranberries and coat well. Refrigerate for several hours or overnight if you can wait! 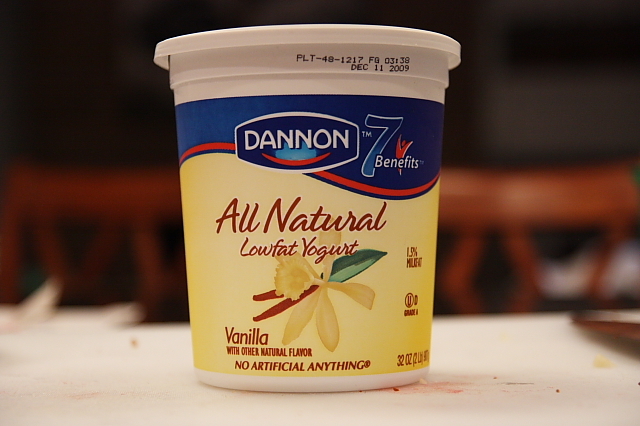 Add all ingredients together and keep refrigerated until ready to serve. I hope you all enjoyed your weekends! Rover discovered Raiger’s red boots! It was really good to stay put, enjoy chilly temps and grey skies. We also had a wonderful Thanksgiving service at church tonight that reminded me of how very much I have to be grateful for! 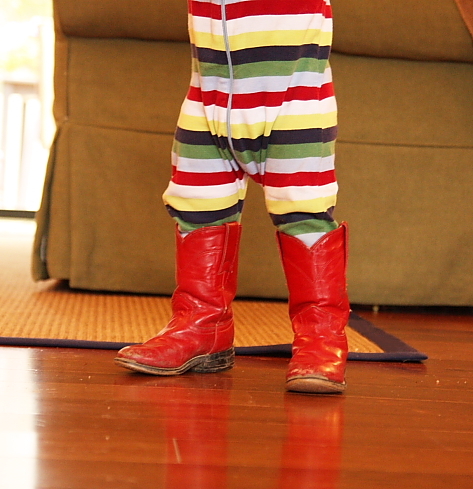 LOVE the red boots…my sassafras has a pink pair just like that that she wears daily (not kidding, i have to hide them if i really don’t want her to wear). Okay, i am SO making that salad. I gag when I see that cranberry sauce comin out of that can. And if I don’t serve it….Katie bar the door. This one, even I can eat!!! Thanks Darbs! One more reminder….my contest ends Thanksgiving day at 12:00 noon. Post comments to win the painting “Grace”. If your readers don’t post, I would encourage all to read the comments. They are so incredibly heart warming. Have a wonderful, wonderful Thanksgiving!!! 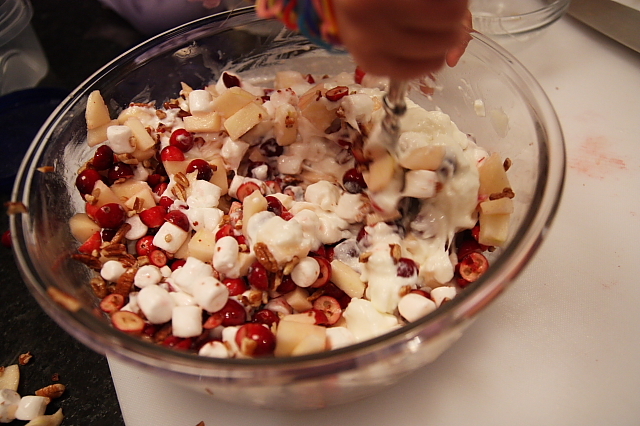 This salad looks simple enough that my kids would actually try it, especially after they see all of the marshmallows. 🙂 Thanks for sharing! Sounds like a great recipe – I might try it this week – thanks for sharing! OH! and I noticed those stinkin’ animal bracelets – why OH why could I have not invented those? – they are EVERYHWERE!!!! My children can’t get enough of them and I’m talking 100s!!!!! have a great week! I can’t stop laughing about the “colorful” nightgown. My girlfriends with older children (and my mom) make constant fun of me, but it is one of my life’s missions to keep Barbie/Disney/character-covered paraphernalia from infiltrating our lives. I joke that I won’t take my daughter down the “barbie” aisle in Target when she is older. I guess a little tacky in moderation is a-okay :-). Thanks for sharing this tasty recipe and Happy Thanksgiving! Yummy looking salad!! thanks for sharing. We got some hand-me-down character pjs and that is all my daughter will wear. I least I can take comfort in knowing I didn’t spend any money on them! Yum. 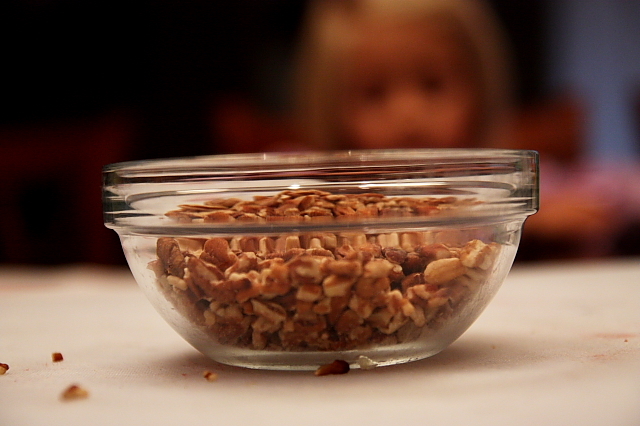 I’m making this to add to our Thanksgiving feast. Thank you! So the colorful gown, I try to tell her she dresses like a “real” princess and refuse to buy anything with characters, but a gown bought be Mema has to be worn every once in a while. I’m cautious. The salad looks so good, I think I will be making it. This sounds great–I love fresh cranberries in the fall! 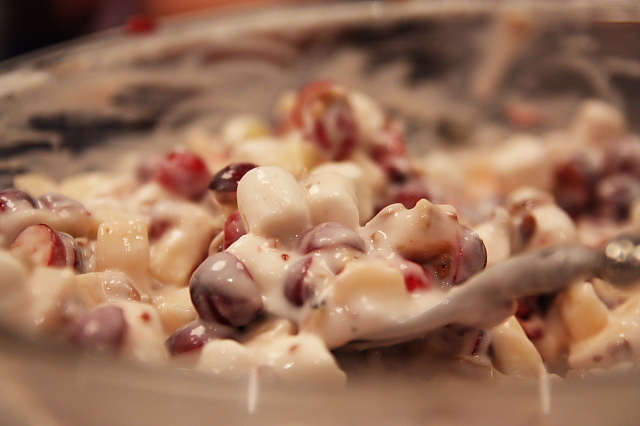 Here’s another recipe in case you’re interested–less healthy than yours but easy and yummy! In a 2 qt. 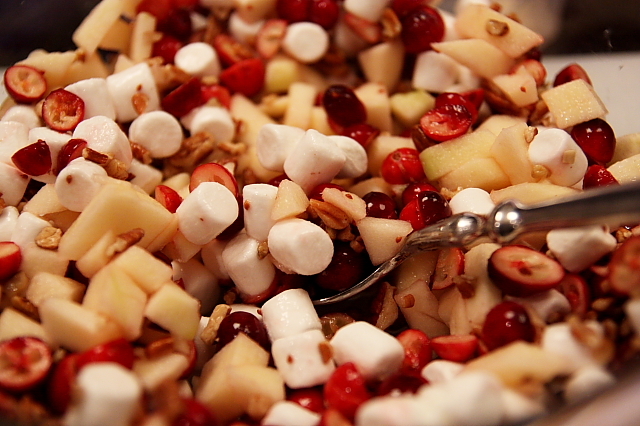 casserole, combine apples, cranberries, and white sugar. 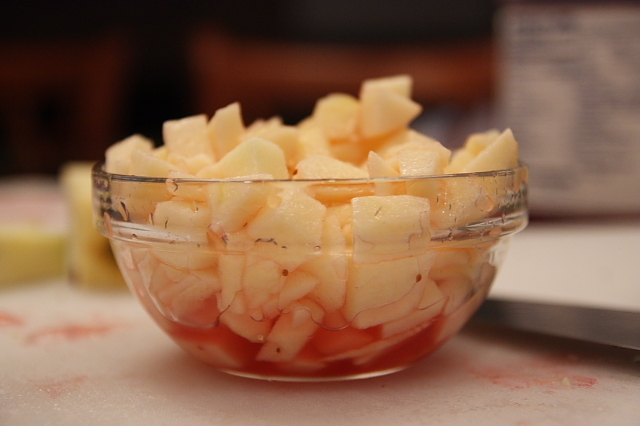 Mix together the other ingredients and layer on top of the fruit. Bake at 350 for 1 hour until bubbly and lightly browned. “Rover discovered Raiger’s red boots!” Say that 3 times fast! Too cute for words! What little boys won’t do. Love the post and the recipe–thanks for sharing snippets of your life with us! oooohhhhh this could not have come in more perfect timing! i am in charge of the fruit salad this year at my husband’s family’s thanksgiving dinner. i was really looking for a festive one too. thanks so much darby! i love reading your blog, thank you for sharing! Darby, I was just about to leave you another recipe called Cranberry/Apple Casserole, but I see someone else already left it for you. It is a Thanksgiving staple at my house. It’s divine in my opinion, a bit more like dessert though! Hope you and your family have a wonderul Thanksgiving!!! Dave loves for me to catch him up on the Sticklers and Powells. We will be going to Louisville this year for Thanksgiving, can’t wait! This looks so yummy and I may just have to make some! Thanks for sharing! The “colorful” night gown kills me. It literally made me laugh out loud. I swore that my children would NEVER wear character clothes or own any “colorful” toys. The reality is that all the “colorful” things make them smile and in turn, it makes us mommies smile!! Lots of love from Tallahassee AND Happy Thanksgiving! i love you. this sounds yummy. Sounds great! Will be making this soon! My children are out of control tonight, spitting, hitting, head butting, up way past their bedtime! Thanks for letting me sneak away to your blog tonight! YUM yum yum! Do you have a sweet potato casserole you love by any chance? I’ve been hailed to make it this year and I’m stumped…. Looked so good, I made it for dinner last night 🙂 Thanks!!! It was delicious. Thanks for posting this. I’m bookmarking for when I can have dairy again. It looks so yummy! Happy Thanksgiving!! Yummmo! Looks super delish, I will have to give it a try. I dont think it looks to difficult, and if you ask me …. it could be a dessert or a side dish! Thanks for sharing… and sharing your shoes too!! t-shirts. They can only be worn to preschool and they get to pick it out. So it’s not just you and your kids. It is happening to all of us. you can also use cool whip instead of yogurt 🙂 i plan to make this as well, one of my favorites! This is on my Thanksgiving Menu!!! Thanks for sharing. This looks really yummy…I am not a traditional cranberry sauce kindof gal so this is a great alternative – and I think the marshmallows will win over my kids!!! Thanks for sharing – I always love reading your blog! Are those silly bands? My 3 1/2 year old can’t get enough of them….they are ALL over our house! Looks yummy! I love the Rover in his red boots and I agree, the princess thing is too much…but she is precious. Saw this recipe and thought of you…looked like something you would like to make with the kids. I would do it, but I stood in my kitchen for four hours baking and cooking today and I am so tired!!!! Happy Thanksgiving! This is often a very smart browse on behalf of me, Should admit that you are one in every of the best bloggers I ever saw.Thanks for posting this informative article. There are lots of healthy ways to deal with your anger. I’ve never been much on cranberry dishes at Thanksgiving ~ I’m more of a stuffing kind of girl, but your salad looks so yummy. Printing out the recipe now! Thank you AGAIN for this recipe. Year 2 of making this salad, because everyone loved it so much last year! Although I am bringing it to share with a different group this year, hopefully they will love it too! I added a few mini white chocolate chips this year and let me tell you….YUMMY! Thanks Darby! Simple machines are basic devices utilized to alter the force necessary to accomplish a task. you fall. There is additionally five various temperature settings, which make sure that your clothes receive just the best. Do not simply write a vague title which doesn’t relate to the rest of the article. Allow yourself to go through the truth of one’s creative experience. so that you can improve the supply of a specific website. use of your sofa sleeper as your bed, comfort is often a big issue.